Wow! First of all, the recent update frequency is breathtaking – as are the art and the story. Secondly, if I didn’t take the leader serious before I do know. I especially love the colors in this page. They seem so dark yet so vibrant at the same time. Mayhaps you’ve mentioned it already. But what’s the Emperor got against dishwater blonds? That is what Towhead means is it not? if boss dies i’m boycotting this comic. “Towheads” being Carissi, I assume? (Oh noooooeeesss the genocide comin’) Pardons for missing whichever tumblr or whatnot post established this. IIRC, “towhead” is kind of an old fashioned term for blonds, typically (but not exclusively) used for children. Whoa! I’d totally never heard that. Thanks! D: “Take the towheads.” I don’t think I like where this is going. Shouldn’t that be “You two!”? Damn. I like the boss kid. There’s a little bit of confusion at the end, with Tom and the eyepatch kid interrupting each other. Maybe the word balloons could stretch between the cells? Look after those hands, you hear :)? Easy on the hand, now, hear me? Your hand is precious. Be kind to the hand. I *like* the Boss. He cares more for the kids than for money. Responsible. That’s good. Btw, ‘taking towheads’ is not the same as genocide. Not yet, anyway. If Luca declares war on Caris, of course he will arrest all Carisi. Britain picked up every German and put them over the border and interred all Britains of German descent. America did the same with the Japanese-Americans. Luca will do so with the Carisi. One hopes. The “not yet” is why I said “comin'”. All I know is Der-Shing hinted at some genocide. Fact is, when stuff like this happens, hate crimes spring up–not just incidental ones, but from groups in power like the military or law enforcement, not necessarily acting on orders–sometimes in great abundance. Coinciding efforts to kill members of an ethnic group with the intention of killing them *specifically* off because their numbers must be purged, even if not coordinated by a head honcho, still files under genocide, even if it doesn’t, say, wipe out half of them. Yeah, we can always hope Luca would be that reasonable, but that isn’t Dagre’s intent, and I think we all know who’s pulling the strings there. Nope, no genocide here. They’re forming a softball team. Softball? Oh, that’s just CRUEL! Yeah, Luca is pretty much insane at this point, so this could turn very ugly very quickly. If a war is declared, one usually follows the decleration of war with the rounding up of those of the enemy’s nationality and either expurging them or keeping them in determent camps. As I’ve said, the USA did the same with the Japanese-American citizens and the Japanese did the same with the European/American inhabitants of Japan. Wasn’t nice. Wasn’t nice at ALL. Was in fact very ugly. BUT! This happens when a war breaks out between two nations and is NOT genocide. Now, since we know that Luca has a tiger-monster in his head that WANTS him to commit genocide, I know that this ’rounding up of undesirables’ will end in mass graves, but this is insider information that the Pasori-on-the-street doesn’t have. Just saying. Oop! Watch out for defining genocide by whether or not a war is going on. I can’t tell if that’s what you’re saying with “This happens when a war breaks out between two nations and is NOT genocide.” or if you’re simply referring to roundups of groups of people, but claiming “this was an ‘acceptable’ act of war, not an act of genocide” is the most common justification for atrocities like the Armenian Genocide, Bosnian Genocide, the Holocaust, etc. I think Marion was talking about the sort of thing described on this site (http://www.spartacus.schoolnet.co.uk/2WWgermansBR.htm). Nasty enough, but there was no intention to outright slaughter all the internees. Obviously, given Luca’s native temperament, grief and rage, and… other factors, plus your hints in comments, I doubt if what is going on in your story is merely internment – possibly Marion missed those points? Oops, watch out when you accuse people from inferring that a genocide is defined wether a war is on or not. Genocide is defined as “the deliberate and systematic destruction, in whole or in part, of an ethnic, racial, religious, or national group”. Internment is the imprisonment or confinement of people, commonly in large groups, without trial. The one is about deliberate mass murder, the other about imprisonment because of possible loyalty risks. Internment of those of the nationality or direct descent of the enemy is pretty standard when war is declared. Think the Germans in Britain (see AndyW’s link below). Even Guantanamo Bay, controversial as that is, is not genocide. Because NOBODY GETS KILLED!!! Internment of those of the enemy’s nationality is standard in a war. Genocide is not. Genocide is mass murder and never ‘normal’ or ‘standard’. That is why genocide is such a shocking word to use the moment, in a webcomic, soldiers start rounding up people of the nationality of the country their leader has just declared war on. We don’t *know* wether the rounded up Carisi will be killed. We *suspect* it (because we know that Luca is in a crazed and murderous ‘kill them all’ state of mind) but it is going a bit too far to yell ‘genocide’ the moment soldiers start rounding up those of the enemy’s nationality after (or even just before) the declaration of war. I prefer to refrain from shouting ‘genocide’ when no groups of people have been murdered (yet). There’s plenty of time for that when the killing has indeed taken place. You’re misreading my point. Don’t worry, I’ve taken a college level course on genocide, and have read numerous papers, analyses and first-person descriptions. I’m not going to mishandle the subject. Whoa, I do my weekly-ish check-in to see if this comic stopped being dead and there’s FOUR new pages! So excited, this is among the highest quality of webcomics around. Can’t wait for more! Haha, check back on Sunday, the remainder of the chapter should be posted by then (or check back daily for even better thrills and chills)! 4 pages in a row, wow that was awesome. So does the Boss really care for the kids more than the goods, or is he afraid for his skin because he’s a towhead? Hmm… I really like this page. It makes you think. Ah, of course, that sentence makes more sense. >.< That´s good. That means he himself will escape too, right, after he sees everyone are safe? Or at least he thinks they have enough time for that, before the soldiers enter the building. The tension! Wtf, I am far more worried about The Boss than I am about Soli and Alamand. I’m worried about him too! It’s interesting that, during an emergency, the boss does turn to the only adult in the room to use as an additional authority figure. Apparently an age-based hierarchy CAN be useful sometimes. (Well, this in addition to the fact that Boss is apparently the oldest “kid” in the organization). Does he? Ive read that as 'get everybody out using our escape route and hey, you two Outsiders over there, we'll safe your butts too, go with them'. That is, imo, hardly an appeal to their authority. Soli doesn't HAVE authority over these kids and the Boss isn't giving her any authority. In fact, by giving them an 'out' and ordering them to take it, the Boss takes responsibility over Soli and Armand. Instead of turning to the 'adult' to be an additional authority figure, the Boss becomes the 'adult', telling the adult what to do. Oh, oops, after re-reading for the 18th time I noticed the ‘take the kids’ bit. I only saw the ‘You too… Get out!’ bits before. Okay I’m hungarian so I don’ know what towheads mean, but I still feel the tension so just keep it up man… but just in case if something serious is going to happen please warn me so I won’t get a shock okay? (The others don’ need to know.) 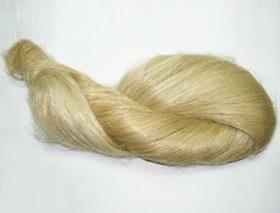 >.<"
“Towhead” is just slang for people with light skin and blond hair, traits possessed by most Carissi. Problem is, most of the people in that room are Carissi. At the very least, this will lead to your standard awful concentration-camp experience (aka. British treatment of Boers during the Boer War, American internment of Japanese in WWII). At the worst, this is the “take and kill” kind of rounding-up. It means blonde. Carisi are (I gather) generally blonde, so any-one blonde is assumed by the authorities to be Carisi, or have some Carisi ancestry. Just generally not to be trusted, and to be rounded up and… well, internment camps sometimes turn into much nastier things. My great grandad was Dutch, and so my Grandad (who was naturalised British) had a Dutch name – which could be taken to be German. When the second world war started, the investment bank he worked for advised all their staff with German or German sounding names to change them, to avoid getting harassed by ignorant neighbours – or worse. I’m guessing a lot of blonde Pasori people are going to be dyeing their hair pretty damn quick! Luckily, there aren’t many blonde Pasoris (nor do many of them live so far South)! There are blonde Santri though, and they’d better watch their asses. Ahh now I get it! This page is awesome. And I´m glad and impressed The Boss himself is this awesome. Man, that´s so great about this comic: that when someone does something heroic, you are actually surprised and impressed and feel the strong probability that this really won´t end well for him. On a somewhat unrelated note, is Amen Carissi or South Santri? His last name is Santri (? ), but he´s working for Carissi military. Is he of mixed heritage? I was also hoping we would find out what happened to him before the end of the chapter, but now it seems we will have no time for this. Amen is Southern Santri! A lot of Southern Santri are religious converts due to proximity to Caris and emigrate/ live there for religious reasons. The next thing that happens is Soli loses any money she may’ve acquired from this ordeal, right? This is what I kept thinking. It’s way too early on for her to have “enough” as she said without losing all or at least some of that money. Things would just be too easy that way! My personal guess is Soli gets caught making sure the others (or at least most of them) make it out, leaving it for cliffhanger. When Angora and Pinter make it to the city, she realizes who Soli (by now up for execution) is and engineers an escape plan (for low values of engineer, and even lower values of plan). Probably won’t go down like that, and it doesn’t cover what happens to Boss and Ali at all, but speculating’s fun, ain’t it? I’m starting to become really fond of the Boss character. I seriously hope he doesn’t get hurt. Also did anyone else notice the wide-eyed girl in the bandana on the last panel? She is so cute. aw, man. I hope the boss survives this. Soli’s determined face in the last panel is awesome. Guess adults aren’t so bad after all eh boss? Pages! Pages! Lovely, lovely pages! I love it. Keep your hands healthy, I can’t wait to see where the story goes. You cannot imagine the respect I have for the boss right now. Shouldn’t it be “You two!”? Or in a case the words are right “You, too!” :>? Hm, maybe. I don’t like that comma though! I’m not super great at grammar so I’m not sure if the second is more correct, but from a reader perspective it looks off to me. Both are correct, but mean slightly different things. If you say “You two!”, it’s more to get their attention, but can also lead into the same idea. In “You too,” whether there should be a comma between “you” and “too” is, I think, the choice of the writer. In the comic setting, especially when the action is speeding up, not having the comma there is (in my opinion) the more optimal of the options. You could write “You, too,” in a slower dialogue, perhaps a dialogue more laden with emotion or indicating a definite pause that means/implies some subtext or emotion, but “You too!” is quicker and adds to the rushed feeling of this page and situation. Yes, I know the difference of the two words and the effect of having or not having a comma. The only issue is whether the grammar is 100% wrong if I leave it out (which I don’t think is the case). Anyways, this is delving too far into minutae. Dude, I love the Boss, just sayin’. It’s okay, Pinter’s keeping it safe! …Really the only choice sensible choice. Please don’t let anything bad happen to The Boss! He’s way to funny and interesting! I already thought the Boss is awesome. Now I love him. Also, excellent job with the busy details. Amazing! Awww, the little girl in panel 6! Lower left-hand panel… <3 Beautiful. I’m in love with this page! The colors, the compostition of panel two and six, Soli’s face in panel five > Witchcraft? The /expressions/ on this page! The second-to-last and third-to-last panels are absolute love. Hmm back to ye olde sewerpipe? Hehe I notice Soli still has her backpack. Is it still loaded by any chance? No I mean the books and the as-yet-undisclosed-item-that-may-be-a-radio. Those still there? Nope, that stuff was in the green bag which was sold. Great page! I love the last panel. I’m so happy for these quick updates, but don’t work yourself too much! Don’t diminish your work and the quality of your drawings! I love your comic and the story really grips. I can’t wait for the next one. I’m soo enthralled. and so sad that i can’t read the whole story now. how many chapters do you think you’ll have, cause what you have so far is AMAZING. Art and visual storytelling are both top shelf, not to mention the whole mystery behind dagre and the other salamander/tree/grandfather guy. I’m excited sir. Soli should want to be like The Boss when she grows up. …and that’s how Soli and Alamand adopted 30 kids and lived happily ever after. The End. 6offee, you owe me a new keyboard, ‘because I spit-laughed coffee all over this one. IT’S THURSDAY AND THERE’S NO UPDATE. RAAAAAAAAAGE. Jk. I really love how you do expressions! … I’m done, I promise! DON'T MESS UP YOUR HAND. WOW! Just finished reading this masterpiece up until now and I AM LOVING IT. I laughed and cried and fell in love with this world right from the start. Love your style of drawing and it’s easy to see how hard you work on it (story wise and drawing wise). All in all, one of the best webcomics I have read, and I hope to see more of it in the future! 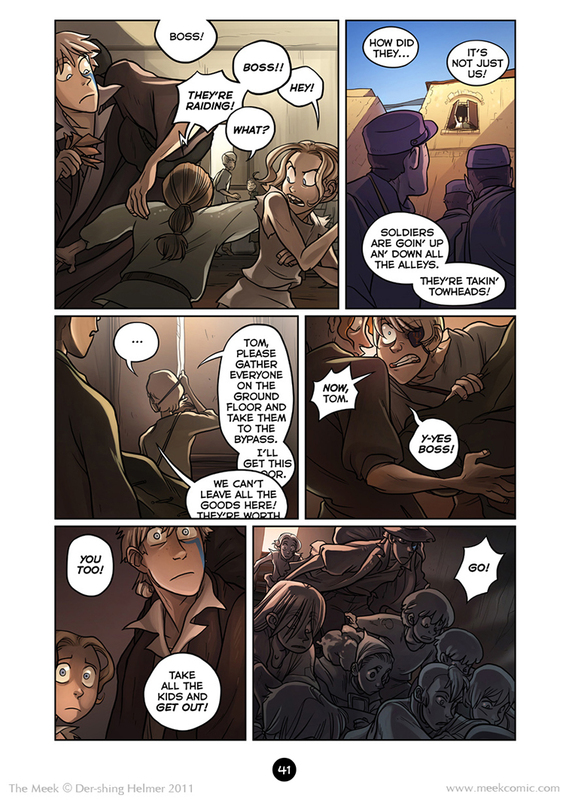 I love Alamand and Soli’s expressions in the fifth panel! …and, you know, the whole page. Is towheads a derogatory term for Carissi? Cuz they’re blonde?? It’s a general term for a blonde person; I think “tow” meant “flax” in old English. I guess it’s used in a derogatory way in the world of Meek. Actually my hair looks more brown than blonde now, but I never pass up the chance to sue someone. Haha, it’s not actually meant to be inflammatory, it’s just an informal way to say Carissi. dude, i TOTALLY feel you about the tendonitis, it happens to me to. (ive been drawing a lot over the summer and the past months for my college portfolio).